I’m on a high. 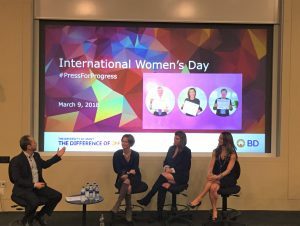 I just finished a presentation as a guest panelist at BD (my former employer and rock star healthcare company) to mark International Women’s Day, an important milestone celebrating women and diversity in the workplace. As amazing as the panel was, I realize that as part of the journey in preparing my remarks and reflecting on my life experiences, I was really witnessing historic change. Change for women in the workplace and at home. 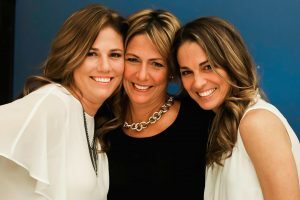 To add to this epic experience, my two sisters who are also fellow business owners, mothers and entrepreneurs, Alison and Jill, joined me, to make the event even more special. 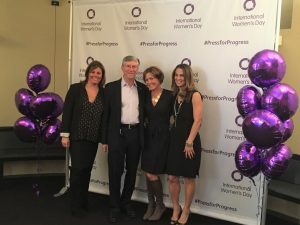 We were so proud to be included in the inspirational discussions on the advancement of women and diverse populations around the globe. As siblings, trust me, we had our rivalries, but today the focus was on what we have in common. Despite the different industries in which we work and started our own businesses, we each saw unique opportunities. In short, we found gaps where we knew we could make things better. Our common thread? Find ways for women to achieve better work-life integration. Discovering these gaps that aligned with our morals and values as women and people united our passion with a purpose, igniting a new energy to pioneer change. Knowing how important family support was in my journey led me to focus on my own family in my career. That means, finding ways to integrate my personal life with my work. By this, I don’t mean work-life balance, it’s about integrating the two. In some cases that meant taking business risks to realize an opportunity. This was at times daunting, but with the right intentions in place and by tying the risks to a greater purpose, the benefits always outweighed the risks. When Deborah Fowler and I founded Green Room Communications 10 years ago, we understood the needs of women and diverse populations who needed to work in different and innovative ways. We have applied our mantra of “work-life integration” to how we run the business today. Our approach allows for creativity and flexibility while tapping into people’s best talents to get stellar results for our clients. There’s a saying, “The most successful women don’t run from change, they run toward it.” This concept of embracing change has been instrumental for us, as well as for my sisters. Green Room was founded on the premise that to be truly innovative, you must embrace the wave of change. Whether we are filling the gaps in understanding and communicating to new and evolving audiences or becoming a WBENC-Certified Women’s Business Enterprise, we are uniting the needs of the business with the passion of doing what is right. With this mindset, Deborah and I have received multiple awards as leading entrepreneurs and women in business throughout the state and country. Having my own company has opened my mind and heart to press for progress and accelerate change for more inclusive workplaces. When you own your own business, you must see every side of the story and appreciate differences in new ways. With Green Room I am crafting a new chapter of my life while helping my clients tell the stories of their evolving businesses where change isn’t shunned, but embraced and seen as true progress. The journey continues.